Films are organized in three sections: Le retour de Dracula with Horror of Dracula (1957), The Curse of Frankenstein (1956), The Revenge of Frankenstein (1957), Dracula, Prince of Darkness (1960), The Brides of Dracula (1960); Sous les lunes de Satan with The Two Faces of Dr Jekyll (1959), The Vampires Lovers (1970), Dr Jekyll and Sister Hyde (1971), Demons of the Mind (1971), and The Devil Rides out (1967); La fabrique des monsters with The Gorgon (1963), The Plague of the Zombies (1965), The Reptile (1965), Frankenstein Must Be Destroyed (1969), and Frankenstein and the Monster from Hell (1972). The British Museum hosted a “day of horror films that feature mummies and ancient Egypt” in relation to their exhibition Journey through the afterlife: ancient Egyptian Book of the Dead. Their Mummy Movie Marathon featured The Mummy with Boris Karloff (1932), The Mummy with Peter Cushing and Christopher Lee (1959), and Blood from the Mummy’s Tomb (1971) along with guest speakers Egyptologist John J Johnson, UCL, and film critic Kim Newman. 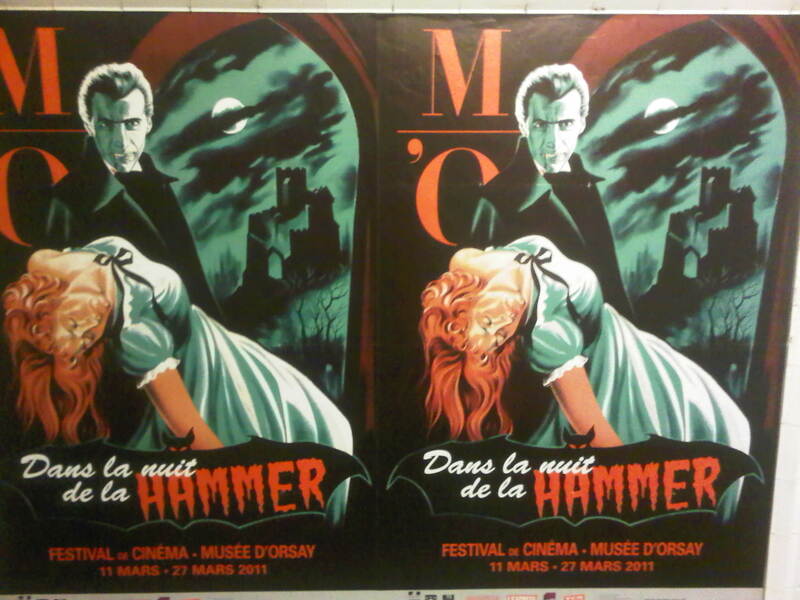 The ICA in London has been on-point supporting horror cinema so far in 2011. They started the year off with New Year’s Fear, an all day event of “four fright-filled previews of forthcoming horror highlights to start your New Year with a scream”. I Spit On Your Grave (2010), Machete Maidens Unleashed! (2010), The Reef (2010), and The Ward (2010). As one of the few venues looking at current horror rather than historical horror, they screened the brilliant Italian homage yet utterly original Amer (2009). In January they hosted a special screening of Amer and Dario Argento’s Tenebre with Amer directors Helene Cattet and Bruno Forzani present for a Q&A. Organized by the Museum of Moving Images assistant curator Livia Bloom It’s Only a Movie: Horror Films From the 1970s and Today screened thirty-two features films, documentaries, shorts, artist films (Aida Ruilova’s life like) and events all in the name of horror cinema past and present. Films included The American Nightmare (2000), Texas Chainsaw Massacre (1974), Hostel (2005), The Devil’s Rejects (2005), The Hills Have Eyes (1977), Martin (1977), The Girl with the Crystal Plummage (1970), The Descent and others. Related: read the transcripts of “Considering Horror Panel Discussion” (June 2007) held in conjunction with the screenings. This panel (moderated by Bloom) included Adam Lowenstein, author of Shocking Representation: Historical Trauma, National Cinema, and the Modern Horror Film and cinema studies professor at the University of Pittsburgh; Nathan Lee, film critic for The Village Voice; Maitland McDonagh, author of Filmmaking on the Fringe: The Good, the Bad, and the Deviant Directors and film critic for TV Guide; and Joshua Rothkopf, film critic for Time Out New York.